The car is fitted with driver’s air bag. As optional it can be fitted with passenger’s air bag, side bags and window bag. The front air bag (driver and passenger) has been designed to protect the occupants in the event of head-on crashes of medium-high severity, by placing the cushion between the occupant and the steering wheel or dashboard. Front air bags are designed to protect car’s occupants in front crashes and therefore non-activation in other types of collisions (side collisions, rear shunts, rollovers, etc.) is not a system malfunction. In case of front crash, an electronic control unit, when required, triggers the inflation of the cushion according to the severity of the collision. The cushion immediately inflates, placing itself as a protection between the body of the front occupants and the structure that could cause injuries. Immediately after, the cushion deflates. The front air bag (driver and passenger) is not a replacement of but complementary to the use of belts, which should always be worn, as specified by law in Europe and most non-European countries. In case of crash, a person not wearing the seat belt moves forward and may come into contact with the cushion while it is still inflating. Under this circumstance the protection offered by the air bag is reduced. car wedging under other vehicles or protective barriers (for example under a truck or guard rail); as it offers no additional protection compared with the seat belts, consequently, it would be pointless. Therefore, failure to come into action in the above circumstances does not mean that the system is not working properly. stickers or other objects to the steering wheel, to the air-bag cover on the passenger's side or on the side roof lining to the upholstery on the roof side. Don’t place objects on the dashboard passenger’s side (such as mobile phones) because they could tamper with the correct opening of the passenger’s air-bag and than cause serious injuries to the vehicle occupants. It consists of an instant-inflating cushion contained in a special recess in the centre of the steering wheel. It consists of an instant-inflating cushion contained in a special recess in the dashboard; its volume is bigger than the driver’s one. The driver’s and passenger’s front Air bags have been designed and calibrated to improve the protection of a person wearing seat belts. is fitted with an air bag on the passenger’s side. Never place cradle child’s seats on the front passenger’s seat of cars fitted with passenger’s air bag since the air bag activation could cause serious injuries, even mortal. front passenger's air bag, the air bag shall be deactivated when placing a child' seat on the front passenger's seat. The front passenger seat shall be adjusted in the most backward position to prevent any contact between child’ seat and dashboard. Even if not compulsory by law, you are recommended to reactivate the air bag immediately as soon as child transport is no longer necessary. Should it be absolutely necessary to carry a child on the front seat, the passenger’s air bag on the car can be deactivated. 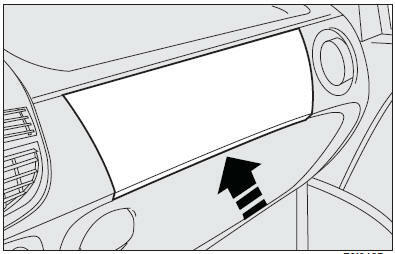 Deactivation/reactivation takes place with ignition key at STOP and operating it in the special key switch on the right-hand side of the dashboard. You can reach the switch only if the door is opened. When the door is open, the key can be inserted and removed in both positions. IMPORTANT Operate the switch only when the engine is not running and the ignition key is removed. absolutely prohibited to carry a child on the front seat. possible to carry a child protected by special restraint system on the front seat. The warning light Fon the cluster stays on permanently until the passenger’s air bag is reactivated. Deactivation of the passenger’s front air bag does not inhibit operation of the side air bag.